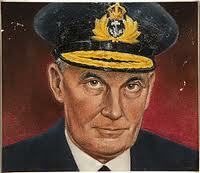 What was my link with the life of Admiral James Somerville? Having set the scene, I wondered how Admiral Somerville might have found an alternative way out of the dilemma he faced at Mers el-Kébir. I knew that after he had ordered his men to fire on our late allies in the French fleet, Somerville had written to his Wife, and to his fellow admirals, bitterly regretting that he had allowed himself to be bullied by Churchill into taking such a disastrous course of action. To his dying day, Somerville must have gone over and over in his mind what he should have done. After all, if Somerville never had any viable alternative, there would be no alternative history narrative for me to pursue. Then one day the obvious answer came to me, the alternative course of action Somerville could have taken, which might have altered the course of the history of the whole world. So I typed it out, just as if I had always known it. And all the blocked alternative courses of action were suddenly opened up, for both Axis and Allies to follow. Real life is far stranger than fiction. In a world full of startling coincidences, here is one more to ponder on. Perhaps now, Admiral James Somerville, your ghost can rest in peace. So, how can you explain this startling “coincidence”? The Second Edition of “Moment of Destiny”, the Alternative History of the Second World War, is available from amazon.com as an e-book, for downloading on your reader or PC.